Article taken from Good Old Boat magazine: Volume 1, Number 2, September/October 1998. Those of us who love good old boats do so out of aesthetic preferences, sailing abilities, and - let's face it - a certain consideration of economic factors. If cost were not a consideration, I know I would be sailing a Hinckley, Alden, or whoknowswhat? as opposed to my little 1961 Pearson Ariel. It isn't all economics, since I do get a lot of satisfaction from my own accomplishments in giving new life to an older boat. At times I do tire of always having to fix something, though. Is there something wrong with my attitude? I really don't think so. We all go to the boat shows and oooh and aaah over the shiny new models, admire the clean new diesels, and talk to the sailmaker about that new genoa we want for Christmas. They quote a price, and we walk away. It isn't that we don't want or need the new sail, but the price is, well, "out there." There is another way. A series of reputable companies specialize in selling new and used sails obtained from lofts and individuals who trade in or sell the sails they no longer want or need. Sometimes available sails are the result of an overstock of new sails ordered by a charter company that failed to pick them up. Sometimes they come from a person like me who buys a boat with many sails when only two or three are actually needed. Many new boat buyers are sold a "compete set" of sails including three genoas, a spinnaker, storm jib, trysail, and riding sail in anticipation of a long cruise to the islands that never comes to pass. The boat is sold to someone else who just wants to sail on the sound, and the excess sails are sent to a sail broker who buys them on consignment or purchases them outright. There are thousands of perfectly good sails available through these sail brokers at a fraction of the cost of the new ones. These sails are rated according to condition, useful life, and appearance. A sail with a surface rust stain can be listed as "like new" but will cost half as much as the same sail without the stain. I have bought and sold sails through a broker over the years, and they have been good experiences. I'm sure the representative firms listed in the appendix of this article would reflect similar experiences. Some used sail brokers sell on consignment, giving the owner a 65 to 70 percent return on the sale. They hold a sail for a set number of months and progressively reduce its price until sold or redeemed by the owner at the end of the specified time. Some sail brokers purchase outright and resell the sails. This affords the owner instant cash flow, as opposed to waiting on a consignment sale. One might expect to receive less money for the outright purchase, but it depends on the sail, market conditions, and so forth. Other used sail brokers will purchase or sell on consignment, or arrange for a tax deductible donation of the sail. There are sail brokers who deal mostly in new sails made overseas at a lower price than those in U.S. lofts. The sails usually come with a two-year and a limited (10- or 30-day) 100 percent satisfaction guarantee. It all depends on what you want or expect from the sails. Remember, a sail purchased from a broker was not custom-built for you and your boat. There may be compromises in the sail that you need to consider. The weight of the cloth may not be exactly what you were thinking of, or the exact luff length, foot length, batten length, etc. The exact configuration of the sail is a compromise which you have to evaluate, based on the asking price. Quality and fit are direct functions of price. Ordering a sail is easy, but does involve some work on your part. Although your boat may be a Pearson 26, for example, there were many Pearson 26s built over the life of the design, and the spars may not be identical, or earlier owners may have made changes. It is always best to measure your own rig and use those dimensions to decide on the sail you wish to buy. I is measured from the top of the jib halyard sheave to the deck (actually the sheer line). J is measured from the center of the stay at the stem to the front of the mast horizontal to the waterline. P is a measurement from the main halyard sheave box to the main tack fitting. E is measured from the main tack fitting to the "black band" on the end of the boom. LP = luff perpendicular. This determines the percentage (i.e., 150 percent genoa) your headsail overlaps the mast. The formula: J x % = LP. 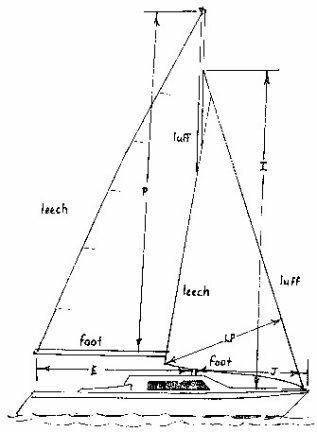 In order to fit well, a sail must be able to be tensioned on the luff and foot and not be "too big" to allow for adjustment and stretching of the sail over time. If a sail requires re-cutting to fit your needs, you may lose the price advantage, and your local loft may not want to work on a used sail purchased elsewhere. Changes in hardware from hanks to luff tape or sail slider to bolt rope or slugs will increase the price of the sail to you. There are literally thousands, if not tens of thousands, of sails out there in the discount new/used marketplace. Your local sailmaker may have used "trade-in" sails also. Check out his inventory. If you need to alter a sail you propose to purchase, look around some more. There may be another sail at a different broker that is just what you want without having to make the changes. 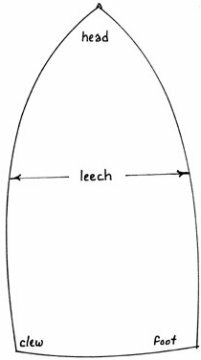 When looking for a new/used sail, use proper terminology and know your sizes. Usually, you can ask for a list of sails by type and size, and the broker will send you a list of all sails he has in that range. 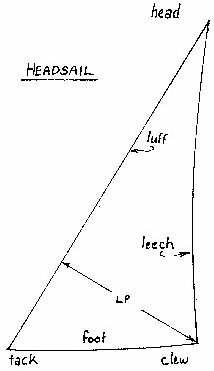 As an example, assume the mainsail luff is 20.8, the leech is 22.8, the foot is 9.7, and the weight is 5 ounces. 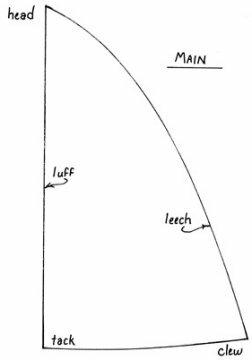 The broker will send you a list of mainsails with a luff of perhaps 20 to 24 feet, leech of 21 to 26 and a foot of 9 to 10 feet. The weight of the sailcloth usually corresponds to the size of the sail, so that does not need to be specified unless you are looking for a storm sail or other specialized sail. The same holds true for the genoa, spinnaker, drifter, blooper, etc. Don't be in a hurry. The sail broker's inventory is changing all the time, and brokers will usually send you two or three updated lists on one request. If you don't see what you want, go to another broker or request the list in a month's time. When you decide to buy a sail from a broker, be sure you understand the descriptions. "New," "like new," and "excellent" are self-explanatory. "Very good" usually means 65 to 75 percent of life is left in the sail. "Good" has 50 to 60 percent of its useful life left. "Fair" means wear and stains with some life left. "Usable" is - well, it isn't ripped, but it is probably bagged out, in need of repairs, and available at a bargain basement price. Some brokers use definitions that are slightly different but similar to the above. Check that the hardware will fit your spar and that the dimensions are correct. Brokers usually allow the purchaser to hoist the sail to assure proper fit, but they don't allow you to take it for a sail. Some brokers allow 10 days for evaluation, while others allow 30 days. Some brokers pay the freight to have an unsatisfactory sail returned, while others will expect the purchaser to pay the return freight. Be sure you understand and are happy with the "conditions of sale" before you buy. For many of the firms advertising as sail brokers, sails are only a part of their business. They may also handle furling systems, used winches, winch handles, and rigging needs. If you have other sail-related needs - from a boom vang to a rope clutch - ask the broker. Winches, in particular, can be a good buy from a broker as you may be able to obtain a self-tailing pair in very good condition two sizes larger for the new price of a smaller non-self-tailing set. As a common practice, major credit cards and checks are perfectly acceptable methods of payment. Finally, if you have all the sails you need but they are just a little tired, there is an economical way to breathe new life into them. SailCare will take your old sails, inspect and measure them, determine if any repairs are needed, and check the cloth for sun damage and deterioration. Your sails are cleaned and impregnated with new resin. SailCare saturates the cloth with the resins and sets the resins with controlled heat. A fungicidal agent is added to inhibit mold growth. A water repellent as well as a UV protector is also added. Remember that this process will not restore a bagged-out sail to its original shape. It will just clean and resin the existing shape. Sails must be setting with a satisfactory shape to be worth sending them off for this treatment. The sail will be returned clean, nearly wrinkle-free, and much stiffer. The cost of treatment is between 11 and 12 percent of the cost of a new sail from a U.S. loft (excluding any repair costs or modifications made to the sail). SailCare is a full-service loft. I am unaware of other firms that perform similar work, but there may be some out there. Contact information for SailCare and a representative list of sail brokers is listed below. There are more brokers. Ask your local loft or yacht broker about sail brokers in your area. Most transactions are conducted over the telephone with shipment via UPS. I live in Mississippi and brokered my sails in Annapolis, Md. The sails were sent to whoknowswhere. If you must have new sails with the latest technological advantages, or if you race, visit your local loft. But if you need a deal on new wings for your good old boat, contact a sail broker. Bill Sandifer, a marine surveyor and small boat builder, has been living, eating, and sleeping boats since the early '50s when he assisted at Pete Layton's Boat Shop, building a variety of small wooden boats. Since then Bill has worked for Charlie Morgan (Heritage), Don Arnow (Cigarette), and owned a commercial fiberglass boatbuilding company (Tugboats).